점의 기행은 작가에게 있어서 가장 일상적인 공간인 집과 작업실 사이의 의미를 살펴보고자 한 작업이다. 작가는 집과 작업실 사이의 경험을 분절/해체시키고 공간을 새롭게 경험할 수 있는 방법을 수행한다. 집(0km)-작업실(88km)사이를 3박4일동안 걸으며 공간 속에 시간의 양을 다르게 압축시켜 일상에서 빠르게 지나가버리는 닫힌 공간을 아코디언처럼 펼쳐보고자 시도하였다.이 시간의 축 안에는 계절, 날씨, 기분상태, 즉각적인 상황 등이 우연적 요소에 따라 변주될 가능성을 갖게된다. 길 위에서 펼쳐진 것들을 모두 작업의 재료로 삼아 드로잉, 문자, 상황 3가지 형식으로 동시에 진행되었다. 이 과정을 통해 무의미하게 느껴졌던 일상 공간의 의미를 몸을 통해 감각하고, 물리적 공간 사이의 가시적/사유적 풍경을 탐구한다. This work is an exploration of ‘Interspace’ where Jung felt emptiness while going and coming between home(0km)and studio(88km). 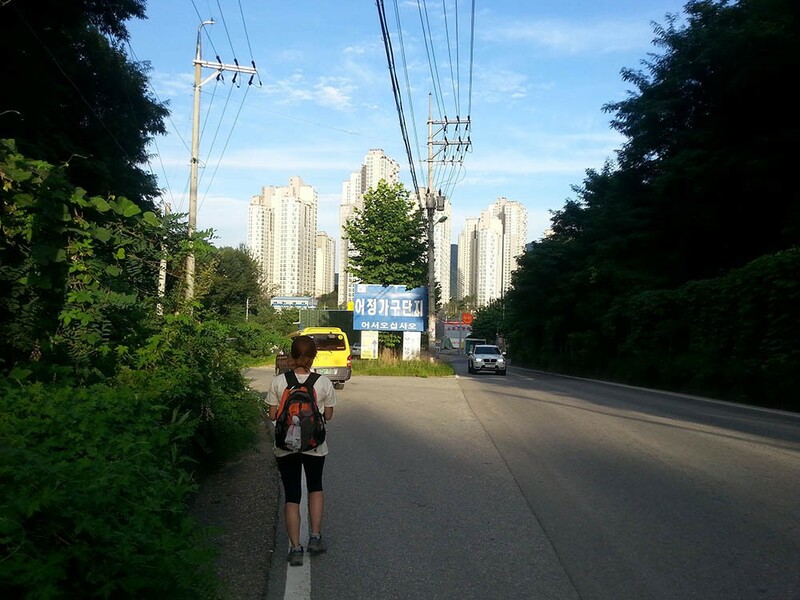 So Jung had walked for 3nights 4days from home to studio. Jung collected all materials such as things, organisms, numbers, sounds, states, and others in the space between home and studio. Jung had suggested 3 ways to view the space. 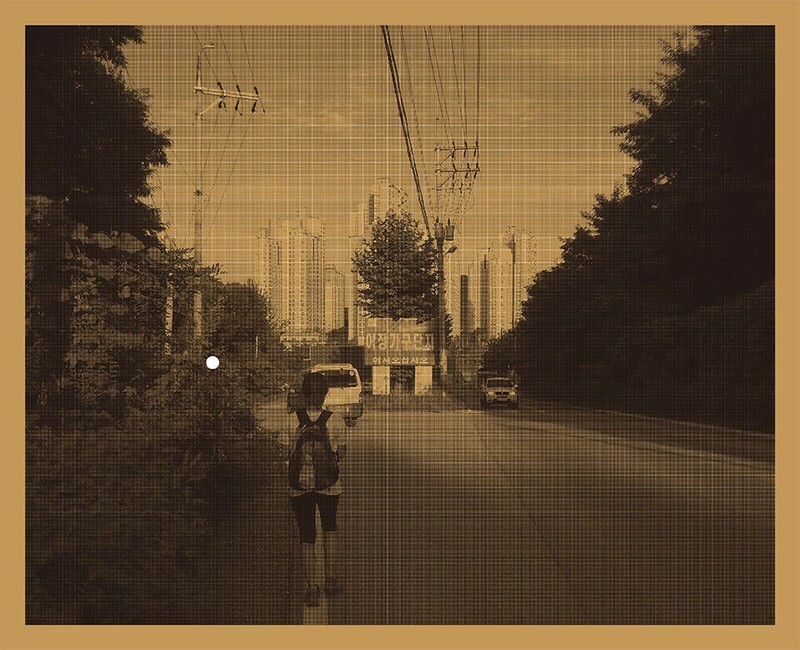 집(0km) - 작업실(88km)를 이동하며 입은 옷이다. 집과 작업실 사이를 더 많이 왕복할 수록, 드로잉이 더 중첩되며 새겨진다. 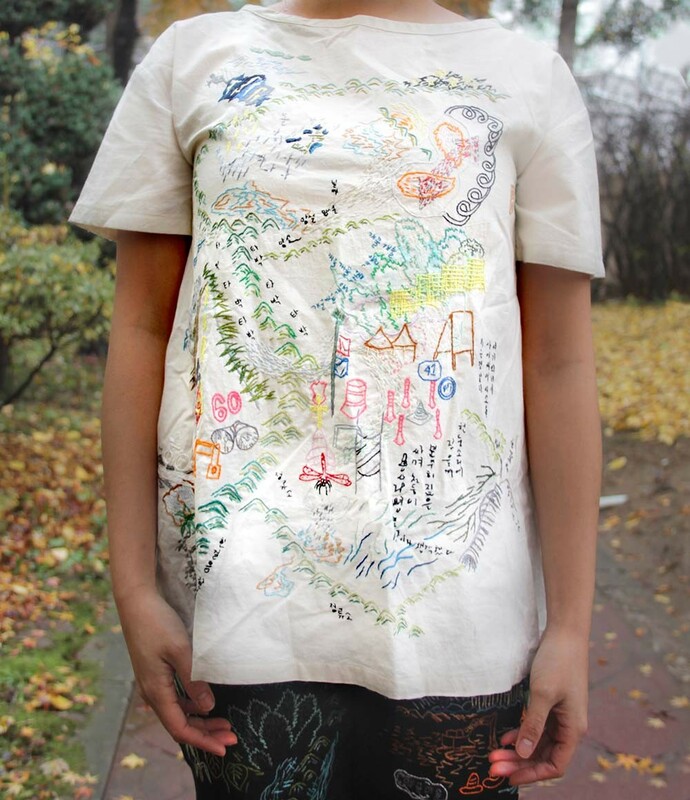 Embroidered the landscape on the cotton clothing Jung had worn. 책의 표지는 압축된 지도이며, 지도에 표시된 숫자가 적혀있는 페이 지를 펼치면 세부내용을 볼 수 있다. 길에서 기록한 모든 것들은 작 업의 재료가 되며, 총 7개의 목록을 통해 시공간을 재구성하였다. 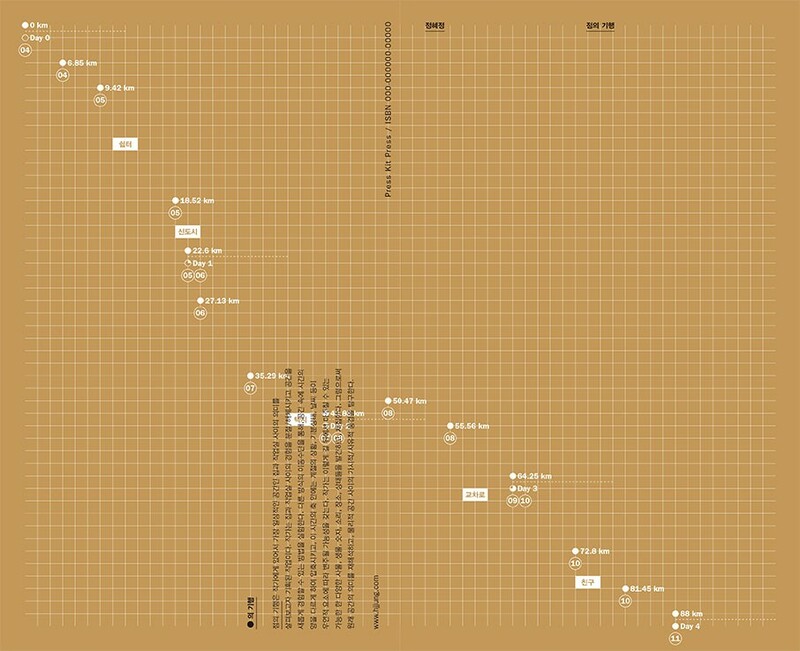 Arranged what Jung had gathered in 7 ways of a new classification, published in a booklet. 5개의 장소에서 벌어지는 일상적인 상황에서 이미지, 언어를 분리시키고, 배우의 목소리를 덧입혀서 낯설게 바라보도록 유도한다. Separated images and dialogues regarding 5 places for mountain shelter, taxi stops, new town, road as stage.